Alan Singer is a historian and chair of the Hofstra University Department of Teaching, Learning and Technology. He is the author of New York's Grand Emancipation Jubilee: Essays on Slavery, Resistance, Abolition, Teaching, and Historical Memory(Albany, NY: SUNY Press, 2018). If I understand Sean Wilentz's new position on the origin of the Electoral College, it, like slavery, was an undemocratic element of the new Constitution endorsed by writers from the North and South who feared slave insurrection, democratic insurgencies like Shay’s Rebellion, and popular government, who represented slave states (there was still slavery in most of the North) or commercial interests tied into the slave trade, and probably got a slaveholder elected President in 1800, but historians shouldn't conclude that they considered that the Electoral College, like the 3/5 clause, the fugitive slave clause, and the ban on banning the slave trade for 20 years, might protect slavery. I don’t consider myself equipped to debate either the earlier or later positions taken by Professor Wilentz, but I thought James Madison might be, so I decided to consult his Notes of the Constitutional Convention. Oliver Ellsworth of Connecticut moved “that the Executive be appointed by the Legislature." Elbridge Gerry of Massachusetts, who later refused to sign the Constitution, argued that “an election at all by the Natl. 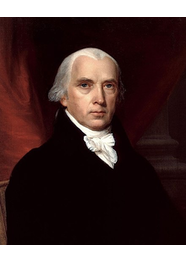 Legislature was radically and incurably wrong; and moved that the Executive be appointed by the Governours & Presidents of the States.” James Madison of Virginia noted that “There are objections agst. every mode that has been, or perhaps can be proposed. The election must be made either by some existing authority under the Natil. or State Constitutions — or by some special authority derived from the people — or by the people themselves. — The two Existing authorities under the Natl. Constitution wd be the Legislative & Judiciary.” Madison opposed the judiciary and legislative options as “liable to insuperable objections.” According to Madison, “The Option before us then lay between an appointment by Electors chosen by the people — and an immediate appointment by the people. He thought the former mode free from many of the objections which had been urged agst. it, and greatly preferable to an appointment by the Natl. Legislature. As the electors would be chosen for the occasion, would meet at once, & proceed immediately to an appointment, there would be very little opportunity for cabal, or corruption.” Ellsworth’s motion that the Executive be chosen by the national legislature was then defeated by 4 to 7 with only New Hampshire, Connecticut, Pennsylvania, and Maryland voting in the affirmative. The idea of an Electoral College was reintroduced by Pierce Butler, a South Carolina rice planter, one of the largest slaveholders in the United States, and one of slavery’s strongest defenders. Butler also introduced the Fugitive Slave Clause into the Constitution, supported the Constitution provision prohibiting regulation of the trade for twenty year,and demanded that the entire slave population of a state be counted for Congressional apportionment. The issue of selecting an Executive was then referred to a special Committee of Eleven, also known as the Brearly Committee. On September 4, the Brearly Committee reported its recommendation that “Each State shall appoint in such manner as its Legislature may direct, a number of electors equal to the whole number of Senators and members of the House of Representatives, to which the State may be entitled in the Legislature.” Gouvernor Morris explained that the committee’s reasoning. “No body had appeared to be satisfied with an appointment by the Legislature,” “Many were anxious even for an immediate choice by the people,” and “the indispensable necessity of making the Executive independent of the Legislature.” Pierce Butler defended the recommendation, although “the mode not free from objections, but much more so than an election by the Legislature, where as in elective monarchies, cabal faction & violence would be sure to prevail.” The motion was then put on hold while the committee considered objection, not to the selection of the Executive, but to the process for removal. On September 6, the edited Brearly Committee report was brought to the convention again. Alexander Hamilton, who had a strong “dislike of the Scheme of Govt. in General,” announced, “he meant to support the plan to be recommended, as better than nothing.” After continued debate and some amendments, Hamilton’s recommendation that the Convention approve the Brearly Committee’s recommendations for the organization of the Executive branch and acceptance of the Electoral College because the final document was “better than nothing,” was finally accepted by the Constitutional Convention and submitted to the states for approval. Madison’s notes do not definitely prove either Wilentz’s earlier or later positions on the relationship between support for the Electoral College and defense of slavery. What I find most suggestive in the debate is the role played by Pierce Butler, one of the Convention’s greatest slavery champions. The Electoral College may not have been expressly designed only to protect African slavery, but based on Madison’s notes, it was the mode most preferred by pro-slavery forces.